As a member of a Toastmasters Club, I have learned to get up and deliver a prepared speech in front of a group of people. I have also learned to get up and evaluate the work of others and also to speak without preparation on a topic I have not been presented with ahead of time. 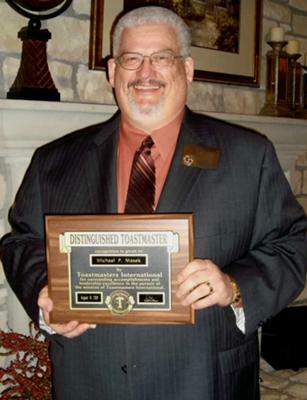 In fact, I have become a Distinguished Toastmaster and I have served as Club President twice and also as Area Governor,overseeing five other clubs. Joining Toastmasters and learning to speak is a process; it is not a class or a one-time event. It is a process of slowly learning to believe in yourself and your talents through practice, positive evaluation and discovery. Toastmasters has helped me to become a better listener too, because I am not always thinking about what I want to say next. I can listen better, knowing that I will be ready to respond when the time is right.